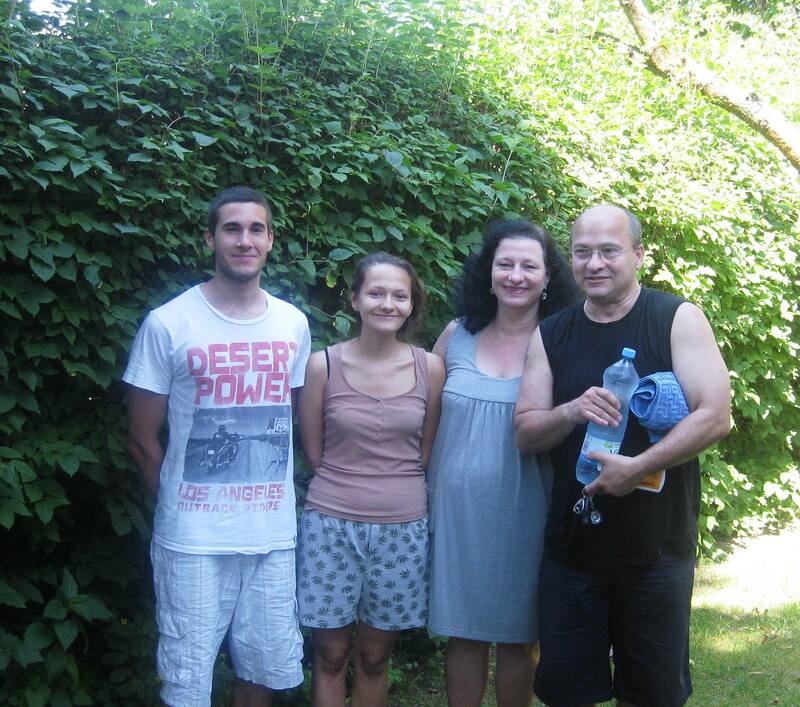 On Friday, Nuala and I set off to visit Heike and her family. Nuala first met Heike thirty seven years ago when they were both au pairs in Paris. Heike reminded Nuala that it was twenty seven years since they last met, when Heike had visited Dublin. 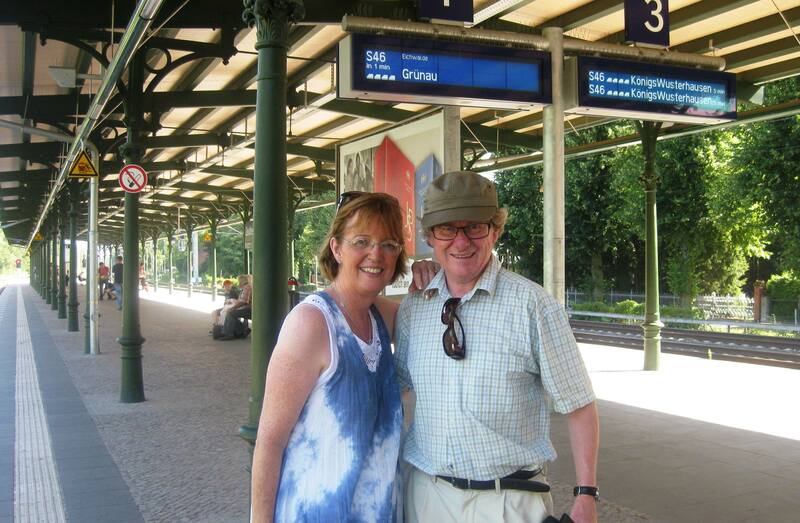 So we set off on S Bann train from Zeuthern to go to Bergfelde on the North side of Berlin where Heike lived. It was meant to be a simple train ride with one change, but as they are doing a lot of upgrades on the train system, many trains were cancelled including ours . We had to change trains six times and it took over two hours to get there! Only for help from lots of friendly Germans (and one Polish man), we would never have got there. At each change someone told us what train to take next. We got to Bergfelde and Heike was waiting for us at the station. 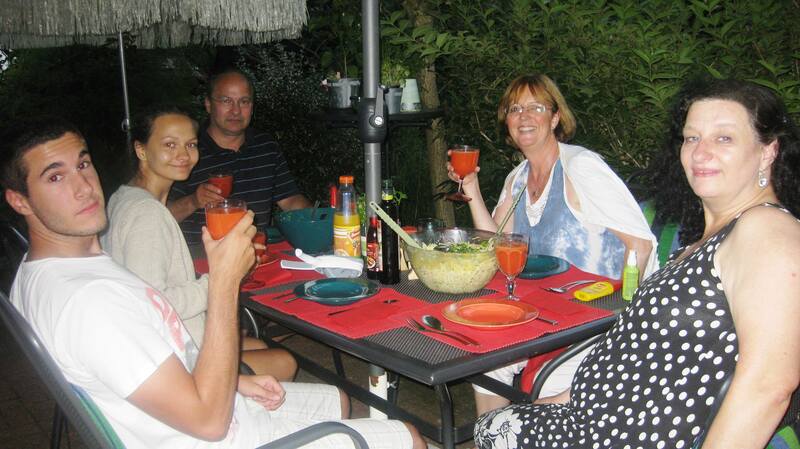 We had a great time with them that evening and a lovely meal out on the patio in front of their house. Heike has perfect English and while Uwe worried about his English, it was great so we had no problems communicating. Their daughter Nina and her boyfriend were there too. (Thanks to Uwe I now have a much better understanding of good German beer). The next day after a leisurely breakfast they insisted on driving us back to the boat. In doing so, they brought us around Berlin and gave us a history lesson on how the dividing of the city had affected Berliners (Heike lived in West Berlin but all her mothers’ family got caught behind the wall in East Germany and she remembers as a small girl going to visit them and being afraid that the East Berlin Guards would not let them go back home). When we got back to the boat, we took them for a cruise up the lake. 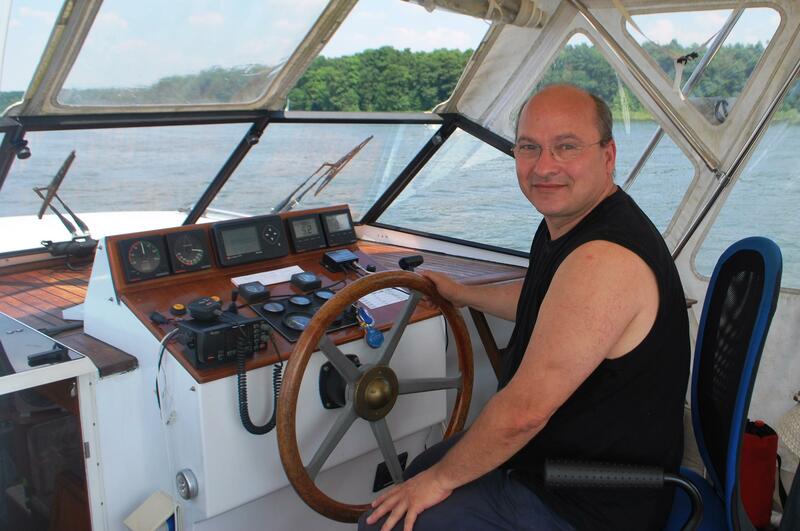 Uwe had a go at the helm and got the hang of it very quickly. 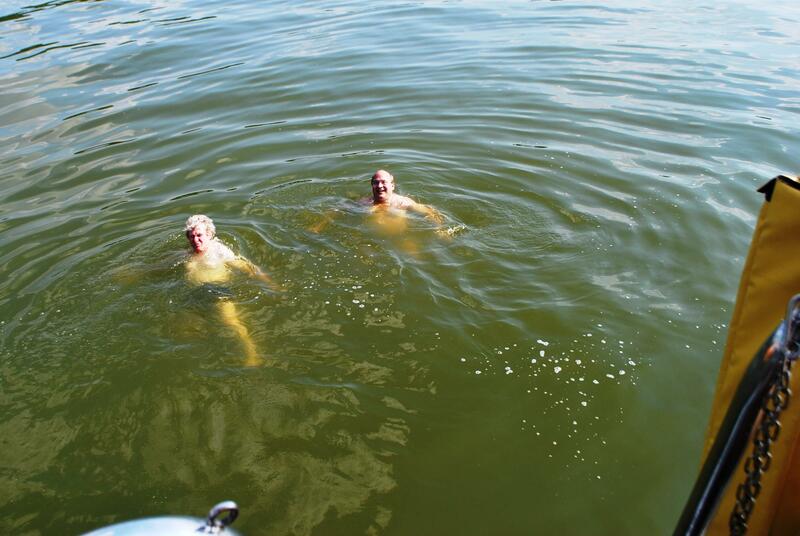 Afterwards we anchored in a bay, had lunch and Uwe and I went for a swim off the back of the boat. The girls spent the time catching up on twenty seven years and staying in the shade, as it was very hot, about 34 degrees. 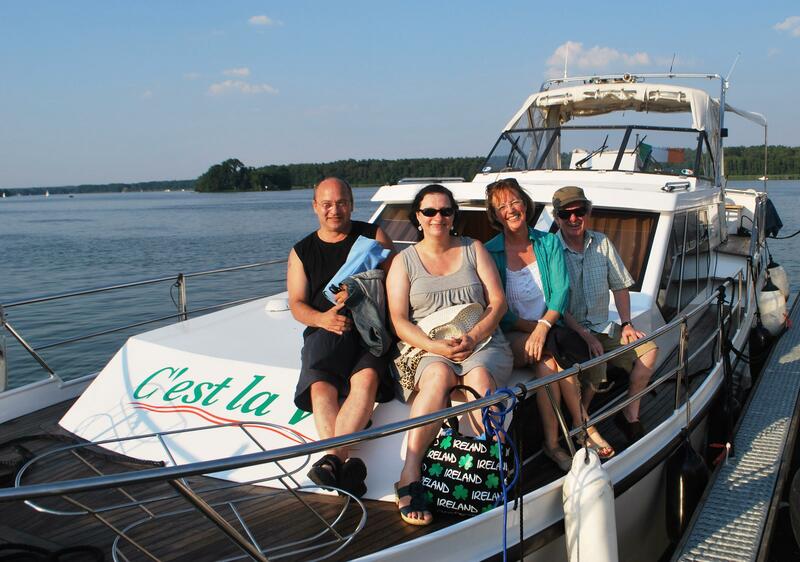 They both said they really enjoyed the day as it was the first time they were on a cruising boat such as ours. We will see them again before we finally leave Berlin and who knows we might have talked them into visiting Ireland! This entry was posted in Berlin, C'est La Vie - The Boat, On the Journey, People We have Meet on the Gap Year, Places visited, Visitors to C est la Vie and tagged au paris in Paris, Bergfelde, Berlin, Berlin Wall, Dublin, East versus West Berlin, Heike, Ireland, Nuala. Bookmark the permalink.